The visibility panel is aimed to manage visibility and visualization parameters of objects for different working modes (Model, 2D Geometry, Machining, Simulation, Tool List and Printing). The and buttons change the objects visualization mode in the graphical window. The first of the buttons switches a mode for all objects: shade, shade with edges and wire. The second button defines a visualization mode for revolution bodies only: 3D, 3D without a quarter, half of 3D and 2D axis section. The button pressing by the left mouse button switches visibility on or off for the corresponding object. But the right mouse button click on the same button opens a pop-up menu to change visualization properties of the object. <Colored> – switches how to draw the object: by one selected color or by different colors (subject to the tool trace for simulation for example). <Transparent> – the object will be drawn as transparent if the option is selected but as solid otherwise. The transparence extent can be defined in the <Transparence> submenu. <Metallic> – turns on the metallic reflection for the object faces. <Display mode> – switches the visualization mode for the object (wire, shade, shade with edges and default) and the drawing method for revolution bodies of the object (3D, 3/4, 1/2, 2D and default). 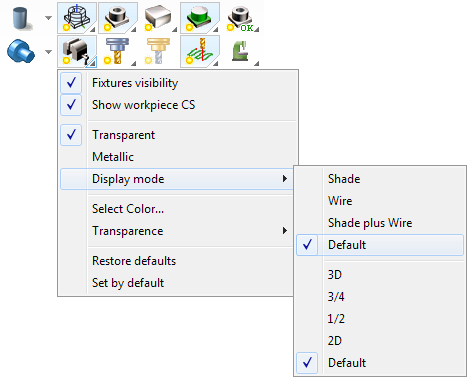 The <Default> item means that the object drawing mode is associated with the main drawing mode which is set by the buttons on the main panel. <Select color...> – opens the color selection dialog window. <Transparence> – shows a list of the available transparence values. The values have a percentage wise. <Restore defaults> – Restore early saved graphical window parameters. <Set by default> – Set all parameters by default values. The visualization property set depends on the object type. It is normally if some object does not have a full list of the properties. The toolpath object does not have such properties as <Display mode>, <Transparent>, <Metallic> etc. Visibility and visualization properties of objects are defined separately for each of working modes of SprutCAM. The <Machining result> button controls the workpiece which is machined for the <Simulation> mode but for other modes the same button manages visualization parameters of the machining result of the current operation (or of the full technological process if there is not any selected operation). The object visualization settings are saved in the SprutCAM configuration file and they are loaded for every execution of the application.